The now consolidated home of bspkrs' mods: ArmorStatusHUD, DirectionHUD, and StatusEffectHUD! HELP! MOD X DOESN'T WORK!!! YOU CRASHED MINECRAFT!! Ok, that's all well and good... and I'd even say that maybe 1/10 times this is my fault. In order for me to help you, however, I'll need some info that you most likely have. Use pastebin.com (or a paste service of your choice) to provide your full log file. If you are using ModLoader, the log file is /.minecraft/ModLoader.txt. If you are using Forge, the log file is /.minecraft/ForgeModLoader-client-0.log (for client) or /.minecraft/ForgeModLoader-server-0.log (for server). Some mods have a setting called allowDebugLogging which should be set to true before you post your log file. WITHOUT THIS INFORMATION IT IS VERY DIFFICULT TO PROVIDE ASSISTANCE, AND THE LIKELIHOOD OF GETTING A RESPONSE IS LOW. I generally do not respond to PMs sent regarding modpack permissions (read the end of this thread and/or read the license) or help/support for any mods (you should post your issue/question on the thread so that anyone that knows the answer can respond). If you recently sent me a PM for either of those reasons, that's why you didn't get an answer. There is a new mod called OpenEye that can help players figure out why their game crashed! It does this by collecting data on crash reports and providing analytics on that data through their website. I highly recommend that EVERYONE install it. The more data they have the easier it will be for others to figure out crash reports! 06-Mar-2014 - 1.8 updates are out for all HUD mods! They are downloadable from my website... I will upload them to CurseForge after PAX. 18-Nov-2014 - In MC 1.8 I will be removing the main menu mob/player rendering gimmick from bspkrsCore. What do you think? 11-Nov-2014 - New releases are out for all mods including bspkrsCore. These releases remove all references to my Dropbox public links, which (due to recent changes to the rules governing public links) are suspended. 30-June-2014 - 1.7.10 releases are out! The only known issue is that the main menu mob rendering stuff isn't showing player skins right. I'm not sure if I can fix it, but we'll see. 23-May-2014 - New releases are out for all mods including bspkrsCore! The latest version of bspkrsCore is required for all the new releases. Please refer to the change logs for details. 25-Apr-2014 - New releases are out for bspkrsCore and ArmorStatusHUD! bspkrsCore got more tweaks to the config GUI system to make it more stable, and ArmorStatusHUD got a new feature related to the in-game config GUI system. 22-Apr-2014 - bspkrsCore 6.6 is out! This release fixes a SERIOUS bug in the code to get random mobs that would prevent certain entities from being able to spawn in your world! It is HIGHLY RECOMMENDED that you update if you are using bspkrsCore 6.4 or 6.5! This release also adds more config GUI functionality. I also released new versions of the HUD mods today that fixes flickering when the player list is shown in MP. 21-Apr-2014 - bspkrsCore 6.5 is out to bring more stability to the Main Menu gimmick code with regard to crashes. 18-Apr-2014 - New releases are out for all mods including bspkrsCore. There are now tooltips for the config settings to give a little more info than just a name. Hover your mouse over the config setting name to see the tooltips. 15-Apr-2014 - ArmorStatusHUDv1.22 and bspkrsCorev6.3 are out! ArmorStatusHUD got a little refinement with the item overlay and item damage options and bspkrsCore got a fix for the config GUI scroll bar not working once you've clicked an option. 13-Apr-2014 - I just spent about a week writing decent code for in-game config GUIs, and now all three HUD mods are using it! New releases are out for ArmorStatusHUD, DirectionHUD, and StatusEffectHUD. NOTE: You need to update bspkrsCore as well! That's where most of the new code is!Minecraft will crash if you only update the HUD mod and not bspkrsCore! 24-Jan-2014 - New releases are out for all three HUD mods. These releases fix a problem with the mod versioning and introduce a hook for enabling/disabling the HUDs. A future release of bspkrsCore will use these hooks to provide a keybinding for toggling them. 20-Jan-2014 - There is an FML defect that causes mods that depend on another mod to not load properly. Remove mcmod.info from the jar file as a temporary workaround. 19-Jan-2014 - 1.7.2 updates are out! Let me know of any issues you find! 21-Oct-2013 - ArmorStatusHUDv1.15, DirectionHUDv1.16 and StatusEffectHUDv1.19 are out to resolve the issue with not being able to use negative values in the x/y offset config settings. There is also a new config option damageThresholdType in ArmorStatusHUD that allows you to use damage values in the damageColorList instead of just percents. Update: bspkrsCorev4.2 is out and brings improvements to the ModVersionChecker class to prevent nagging when new versions come out (you'll only get a chat notification once when a new version is released). 17-Oct-2013 - ArmorStatusHUDv1.14, DirectionHUDv1.15 and StatusEffectHUDv1.18 are out as Forge mods. If you don't know what that means, don't worry about it! 05-Oct-2013 - StatusEffectHUDv1.17 is out and addresses a potential crash. 30-Sep-2013 - I back-ported StatusEffectHUDv1.16 to 1.6.2. 29-Sep-2013 - StatusEffectHUDv1.16 is out. This release tweaks the blink code so that being around a beacon won't drive you nuts. StatusEffectHUDv1.15 is out for 1.6.4 (I will backport this to 1.6.2 and 1.5.2 if I have time later)! This release adds a new feature: the icon and timer start blinking when a potion effect is almost gone! There are two new config options for controlling the behavior; check out the config file for details. 23-Sep-2013 - ArmorStatusHUDv1.13 is out for 1.6.4, 1.6.2, and even 1.5.2. This update tweaks the item damage code to (hopefully) fix issues with items from mods like Tinker's Construct. 20-Sep-2013 - 1.6.4 updates are out! 17-Jul-2013 - New releases of ArmorStatusHUD and StatusEffectHUD are now out. ArmorStatusHUD will now show the correct item display name if it has been renamed, and StatusEffectHUD got a fix for the background covering up the text if it's enabled in the config. Note: all mods have been tested with and work with ModLoader. 10-Jul-2013 - Everything is updated for 1.6.2! New releases are out to resolve the crashes when using ModLoader. 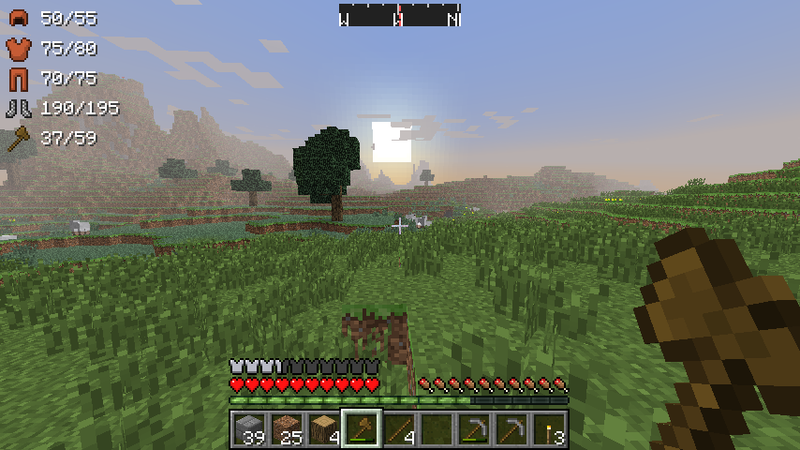 5-Jul-2013 - Everything is updated for 1.6.1 except for DirectionHUD (texture issues). 3-May-2013 - 1.5.2 releases are out for bspkrsCore, ArmorStatusHUD, DirectionHUD, and StatusEffectHUD. 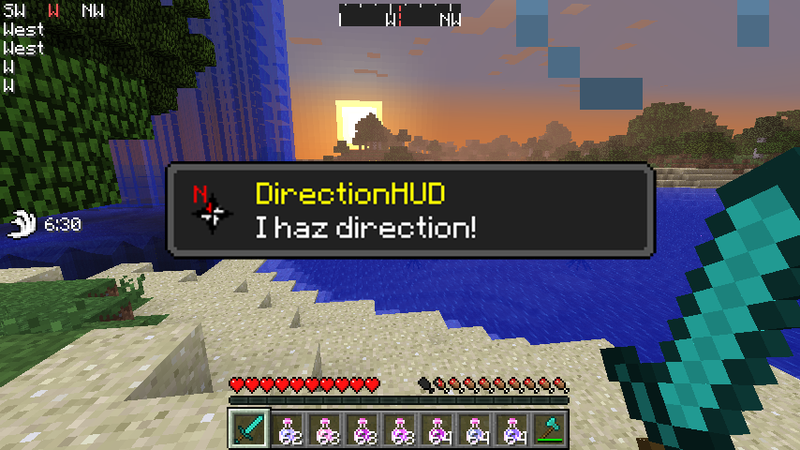 25-Apr-2013 - New release for DirectionHUD is out to fix the texture issue (derp). 24-Apr-2013 - New releases are out for all three mods to fix potential issues caused by other mods that do not clean up their texture bindings after rendering. This update also changes the config handler, so the config files have a new name (mod_.bsprop.cfg). 12-Apr-2013 - I am apparently having The Worst LuckTM this week with hosting providers. All links are updated and should be working now... I will add a permanent mirror for all links later today. 9-Apr-2013 - I have released a new version of bspkrsCore for 1.5.1 and 1.4.7 to address the update check timeouts issue. This release also incorporates a number of other changes including a super secret feature (don't ask, I'm not telling). You will notice that mod_bspkrsCore.cfg is no longer used; mod_bspkrsCore.bsprop.cfg is used instead. This is due to features that I've been slowly working on that are partially being released early as part of this defect release. 8-Apr-2013 - I have gotten the file downloads setup on a new VPS, so the links should be working now. I will update them again once DNS propagates. 7-Apr-2013 - Apparently my VPS is down, and so my download pages as well. You can try here for now until DropBox arbitrarily decides to cut me off again. 23-Mar-2013 - 1.5.1 updates are released!Update - I have re-ordered the list of files for bspkrsCore to avoid further confusion. Also, one of the reasons this release took longer than usual to get out is because I was busy making automated build scripts for all these mods so that anyone can pull the Github repos and run Ant to build the mod zips/jars. Since I was using a new build process, I couldn't release the mods without fully testing them (believe me, you'd all be very upset if I hadn't). I'll provide instructions on how to run the build scripts soon (it's really very easy, and requires no coding knowledge as long as the code is up-to-date). 15-Mar-2013 - 1.5 updates are live on the download site! Change logs will follow tomorrow (I'm tired). 10-Mar-2013 - bspkrsCorev1.02 is out to fix a defect in shared code. Details are in the changelog.23-Feb-2013 - I've just been notified that my DropBox links are generating too much traffic and are disabled. I'm looking into another way to provide downloads. I've been able to work out another way to host the files. Links are working again. 20-Feb-2013 - New releases are out to support bspkrsCore (shared mod classes). 24-Jan-2013 - New releases are out for compatibility with other HUD mods due to a vanilla bug. 15-Jan-2013 - 1.4.6 releases work with 1.4.7.23-Dec-2012 - 1.4.6 updates are out. Let me know of any issues. 21-Nov-2012 - 1.4.5 releases are out for all mods! 13-Nov-2012 - Releases for MC 1.4.4 are now available for all mods. 05-Nov-2012 - Be sure to check out WorldStateCheckpoints, my fork of MightyPork's Checkpoints Backup Mod. It allows you to make save points in your SP worlds! An essential tool for any Minecrafter! 01-Nov-2012 - ArmorStatusHUDv1.4, DirectionHUDv1.8, and StatusEffectHUDv1.7 are out to address compatibility with Forge/FML. I also reorganized all my downloads, so let me know what you think of the new system. 29-Oct-2012 - DirectionHUDv1.7 is out. This release adds two new config options: imageFileName and compassIndex. There are now 4 compass styles to choose from by default using compassIndex, and you can edit the png to add your own if you want (details below). 26-Oct-2012 - ArmorStatusHUDv1.3, DirectionHUDv1.6, and StatusEffectHUDv1.6 are out for 1.4.2! These were compiled using Forge, so I may have to do another release when Risugami releases ModLoader for 1.4.2 if there are any changes that break the mods. Let me know if you see anything strange with the mods. 08-Oct-2012 - I've added just about all the code for all the mods I work on to github. Feel free to see how all this stuff works underneath. 06-Oct-2012 - Retrofits! I've taken the latest versions of ArmorStatusHUD, DirectionHUD, and StatusEffectHUD and magically produced ArmorStatusHUD v1.2(1.2.5), DirectionHUD v1.52(1.2.5), and StatusEffectHUD v1.52(1.2.5). This is the first time ArmorStatusHUD as been released for 1.2.5, so dig in! 05-Oct-2012 - I completely forgot to mention that ArmorStatusHUD v1.2 also fixes the durability values... they were off by 1 before. 04-Oct-2012 - ArmorStatusHUD v1.2 brings a few cool new features. The damageWarningPercent option has been replaced with damageColorList which provides a way to configure the damage percent thresholds and the associated text colors. 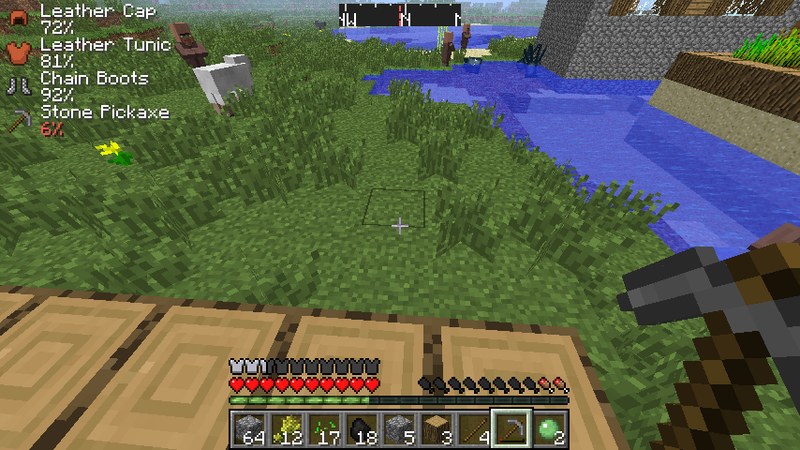 The current equipped item setting now allows blocks and other non-damageable items to be shown. When a block is selected the item overlay will show the total quantity of that block in your inventory. When a bow is selected the overlay will show the number of arrows you have. Update @4:40PM EDT: There was a mistake in this release of ArmorStatusHUD that would cause the item icons to disappear when resizing the game window with top or right alignments. This issue is now fixed in the current download, so if you are affected by that issue please download it again. Before the next release I will be reading up on GL11 Java code...DirectionHUD v1.52 and StatusEffectHUD v1.52 are released to maintain compatibility with this release of ArmorStatusHUD. 19-Sep-2012 - Apparently a fix I put in my mod version checker class to handle not being connected to the internet was full of failure, so I've updated all the downloads that use it with a truly fixed version of the class. I decided not to bump the version numbers for a fix to the version checking code because I didn't want to totally spam everyone over something small like that. Nevertheless, if you like to play without an internet connection be sure to download the latest version (again, if you already have) to avoid game crashing fun. 18-Sep-2012 - I'm not sure how I did this, but somehow I deleted a class file when I was putting together the latest version downloads. The issue should now be resolved... sorry for the issues. 17-Sep-2012 - DirectionHUD v1.51 and StatusEffectHUD v1.51 have been released to maintain compatibility with the latest version of FloatingRuins (they share several class files). 13-Sep-2012 - ArmorStatusHUD v1.1, DirectionHUD v1.5, and StatusEffectHUD v1.5 are out! Major changes include proper item icon rendering for mod items in ArmorStatusHUD, all mods now have x and y offset config settings, DirectionHUD and StatusEffectHUD have better controls over text colors, ArmorStatusHUD has more/better options for the damage display, and all mods have been refactored using consolidated code for easier future updates. DirectionHUD also has a fix for a small yOffset defect that I missed when I put out the last version, and the StatusEffectHUD default settings are slightly different now.I recommend deleting your existing config files to try out the new config options. 10-Sep-2012 - I decided to make a TreeCapitator t-shirt design for the Threadless loves Minecraft challenge. Head on over and give me a critique! Sep-2012 - DirectionHUDv1.41 is now live. Fixes the silly alignment issues with anything that isn't topcenter. Also adds a few other options around x and y offsets and the color of the center marker.Similar features will be coming soon to StatusEffectHUD and ArmorStatusHUD. 29-Aug-2012 - I would like to be able to post my mods on PlanetMinecraft to gain more exposure, but in order to do that I need to "level up" my user (you need to be level 2 or higher to post mods). You can help me get there by commenting on and downloading my submissions! 28-Aug-2012 - If you are using Forge and have an issue with a mod not loading properly, delete the mcmod.info file from the zip file or just download the mod again. It's the first time I tried including it and I wasn't clear on the format. Should be fixed now. Consolidated all my original mods here. First release of ArmorStatusHUD v1.0 and small updates for StatusEffectHUD v1.4 and DirectionHUD v1.4. Version checking can now be disabled in config (for those times that I screw up the version files and don't notice :S). 19-Aug-2012 - Updated StatusEffectHUD for 1.3.2. 29-Mar-2012 (the "YO DAWG..." update):To those seeing errors, please download again. I totally made a n00b mistake, but it's fixed now. That's what happens when you don't run your mod code outside your dev environment before publishing it. IRC: I can usually be found in the #risucraft and #treecapitator channels on irc.esper.net. NO WARRANTY IS GIVEN, EXPRESS OR OTHERWISE. USE AT YOUR OWN RISK. In other words, I am not responsible if this mod causes your game to crash, your save to get deleted, or your cat to run away. Q: How do i move the HUD to another corner (or change any other settings)? A: For ArmorStatusHUD, use the command /armorstatus config. For DirectionHUD, use the command /directionhud config. For StatusEffectHUD, use the command /statuseffect config. ATTENTION: This is a REQUIRED mod in order for any of the other mods to work. It contains the core shared classes used by all mods I release. If you don't install it along with any of the other mods here, Minecraft will crash. You have been warned. If you want to turn off update checking for my mods, you will need to set allowUpdateCheck=false in bspkrsCore.cfg. ALL MODS BEYOND THIS POINT REQUIRE bspkrsCore TO BE INSTALLED. You will be ignored if you post about MC crashing because you didn't install bspkrsCore. - NEW: use the command /armorstatus config to open the in-game config GUI! - option for horizontal layout Done! Want to know what magnetic direction you are facing without installing fancy maps or trying to figure it out from the Debug GUI? DirectionHUD is for you! - NEW: use the command /directionhud config to open the in-game config GUI! - option to allow custom compass images Done! The indices start at 0 (the top compass is index 0). In the default image file the second and fourth styles are clear with white lettering (hard to see above). If you want to edit the PNG file (/gui/compass.png) to add your own styles, just copy one of the existing styles, paste it below the others, and edit it as you see fit. Each stye is 24 pixels tall (2 rows X 12 pixels) and 192 pixels wide. Currently the size of the compass HUD is locked to 65x12 (meaning that you will only see 65x12 on your in-game screen), but I plan to add configurable sizing in the future. Thanks Phobic_Bus! Thanks Jeruhmi! Thanks zain2028! (yeah, he was confused and says DaftPVF created StatusEffectHUD... just a mixup) Thanks TehAnon! Drop the downloaded zip/jar file into the mods folder in your .minecraft folder. Make sure you have also downloaded bspkrsCore, a REQUIRED DEPENDENCY for all my mods. Thanks to oSPARKSo for this helpful installation video! These mods are released under the Creative Commons Share Alike non-commercial License. They are allowed to be used in mod packs as long as I receive credit and the URL of this forum thread is provided. No adf.ly links. Do not post these mods on other sites. Great idea man, if you're looking for more ideas a auto-drink potion feature would be cool . Is this SMP compatible? That's a cool idea... sounds like a different mod, though. I'll think about how to do that. I'm not sure about SMP, but I'd love to hear back from anyone who's tried it. 1. A new item called the potion bag/urn/flask can hold some potions for you, no more worry about running out of room with those unstackable potions! What's more when opening it you can put two potions in a 'hotkey' slot in the bag to auto-drink them when needed. 2. Sound effects when you're running low on hunger, health low, potion effects? Optional support for thirst mod too . 3. Durability alert, sometimes you forget your tools going blunt. This reminds you. Is even more epic if used with a tool repair mod. 4. Some visual display of mobs affected by potions you used, e.g. splash weakness , then a little icon appears above the mob so you remember which one you hit(so you don't hit the same one again). 5. Enchantment tags, want to get that specific enchantment but don't have the xp, only to later forget you ever wanted it? Not anymore if you tag a tool with a specific enchantment you want(via the enchantment table) you'll get a visual display if you've acquired the XP during on of your cavern exploration trips. Almost... I see some roadblocks in the list, but I do like the low hunger sound effects and durability alert ideas. I already have a visual display for tool durability that I wrote into IngameInfo, but the sounds would be a pretty cool addition. you mister just had a very good idea (it does not matter if it exists already somewhere else, love it). Am I right thinking the only access to configuratnio is through the config file ? And this would mean you can only configure the position of the display. Currently, yes and yes. In-game config will go on the planned list... it would be a first for me, but people are requesting it for other mods I'm maintaining, so I should really just dig in. Aside from the position and the items in the planned features (in the OP), what else would you like to see be configurable? Would it be possible to remove the Background and Names, leaving only the effect symbol and time remaining? That way it takes up less space on the hud. This looks to be a very promising mod. I usually don't use mods that don't have too many views/users, but I think I might have to try it out! I absolutely HATE having to look at my inventory to see potion effects! btw, @JonReed, I LOVE that signature! Hahahaha!! Thanks for puttin my Mod Spotlight in the forum thread man! These are already in the Planned Features list in the OP... they are highest on the priority list for this mod. Thanks for the feedback! Let me know how it can be better! Thanks for making it, and on the first day available no less! Yeah it was just a quick brainstorm with no account for potential roadblocks, but at least there are some possible ideas in it . Also I'm not doing the modding for him , just suggestions although I am a modder myself . Next up,possibly, is health display for enemies, but not one of those annoying ugly health bars, maybe a orb that empties out or a flashing effect around mob when it's low on hp. You should have seeen the suggestion list i made for assorted wildlife... something like 19 suggestions and some useful links. Maybe add transparency options? I'm pretty sure that wouldn't be allowed, or harder to implement, but I think if you can it would be very helpful. I know that if there are a lot of effects on at the same time, it can block like a fifth of the screen, so transparency might be useful. That's something I thought about... just not sure how to do it. It will probably be a surprise feature if it ever comes. Should have an update out later tonight or tomorrow providing options to show/hide the bounding box and the effect name. If I have time I might do 1.2.4 using the MCP pre-release too. Version 1.1 is out! Adds options to show/hide background box and effect name! Cool, nice to see some progress. Let us know when you've updated to 1.2.4 too!